As the much-loved music venue changes hands, we look at the grubby glamour of its past and the food-focussed future. There is something timeless about the appeal of an authentic rock and roll pub, where the floor sticks to one’s battered old boots and the whiskey-flavoured tang of a hundred past nights of recklessness is tangible in the air. Such places are hard to come by, for the swagger of tarnished glamour is not something that can be easily imitated. Filthy MacNasty’s on the corner of Amwell Street near Angel is one such place. Attracting weekend rock stars from all walks of life, with the lingering aura of countless cigarette breaths, Filthy’s was once home to a mad, mixed bunch of poets and dustmen, philosophers and gardeners. Its gritty credentials include a delightfully dishevelled list of clientele, including Shane McGowan, Irvine Welsh, Johnny Depp and of course Peter Doherty, who tended the bar here in the early days of The Libertines. Known for serving ‘the second best Guinness in London’, Filthy’s is something of a cultural landmark. Its cracked leather seats and low-lit tables have played host to photography exhibitions and to impromptu Pete and Carl sing-alongs. Former NME journalist and author Paolo Hewitt used to organise literary nights under the title ‘The Sharper Word’, which saw the likes of Chris Difford of Squeeze and Ian McLagan of Small Faces, as well as political poet John Sinclair dropping by to do readings and play a few songs to the unsuspecting crowd, securing the pub’s spot in musical and literary history. 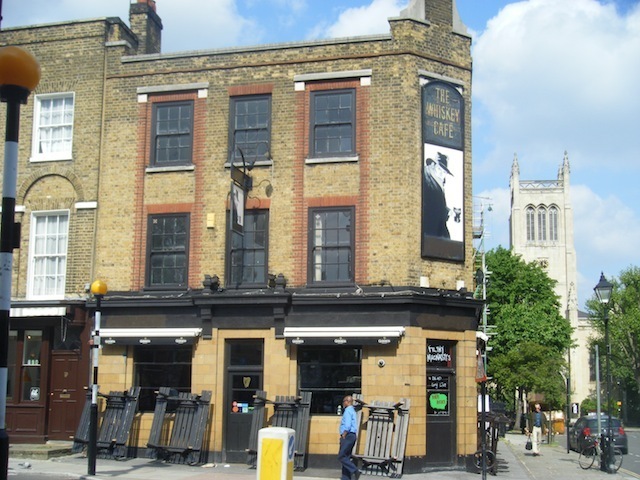 The pub is certainly ingrained in the blood stained pages of Doherty’s infamous Books of Albion, and The Libertines played many characteristic guerrilla-style gigs here, as well as serving as a place for Pete to sleep when he had nowhere else to go. In the height of Libertines furor, Filthy’s hosted an exhibition of the band’s gig posters, and girls would flock to the bar asking to see the walls of Doherty’s old bedroom upstairs. 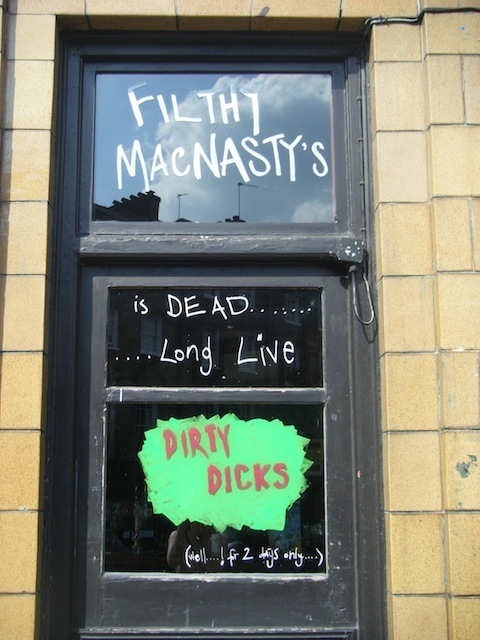 The news that Filthy MacNasty’s is to be closed and to be returned to its original roots as a traditional English boozer with the name of ‘The Fountain’ strikes a sad chord in the hearts of those with a penchant for loud music and stiff whiskey. Surely a place with such rich musical heritage should stay perpetually true to the dirty world of rock and roll? Is this yet another instance of what is good and pure in London Town being replaced by overpriced ales and organic burgers with names that no one can pronounce, all in the name of being ‘British’? Filthy’s is being taken over by Handmade Pubs Ltd., a small company which admittedly runs a number of very pleasant drinking establishments with a rustic feel and sophisticated palette in Shoreditch (The Fox), Camden Town (The Lord Stanley), Primrose Hill (The Lansdowne) and Tufnell Park (Tufnell Park Tavern). From this month, it plans to turn Filthy’s into a pop-up meat restaurant called Meat Lover at Filthy MacNasty’s, which will serve a selection of meats such as ribs, chicken and pulled pork, as well as a variety of cocktails, real ale, wine and lagers. Once the pop-up restaurant has run its course, the pub will be closed for a full refurbishment, before re-opening as a food-focused pub with an a la carte menu, returning the venue to its original name ‘The Fountain’. As enterprising as this sounds, one cannot help but feel a disgruntled rustle in the fibres of one’s motorcycle jacket. Should the haunt of such great punks and poets not be preserved, or at least commemorated in some way? This is a place where writers such as Allan Sillitoe sat in the back room on a Sunday night explaining how he documented the lives of every person he met in the street in order to use them later as characters in his books. A place where Carl Barat sat singing atop Peter Doherty’s shoulders and a place where misfits from various lonely corners of London felt that they belonged. Interestingly, Paul Hallam, who owned the pub in the early 2000’s is now a regular drinker in ‘The Fox’, which is Handmade Pubs’ Shoreditch property. Having originally purchased Filthy’s for its creative reputation, he believes that one ought not to look too harshly upon the takeover of the musical site. He reminds us that although Handmade Pubs are less interested in the history of Filthy’s, they are not a soulless consumer chain and will most probably create a tasteful and friendly drinking environment. 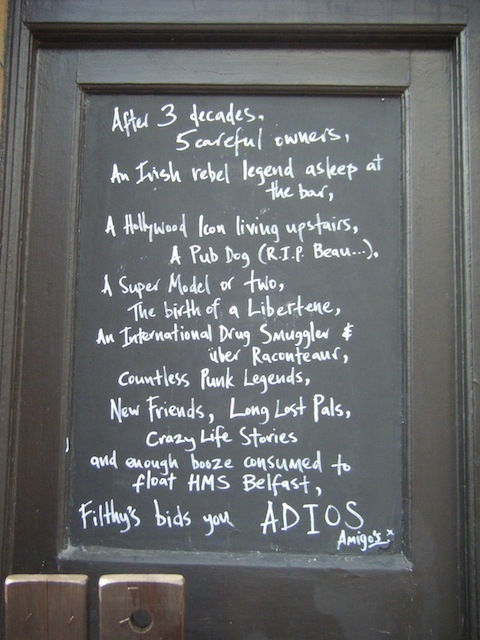 Perhaps Filthy’s, like The Libertines, has had its day and instead of mourning its loss, one should be grateful that it is not to be replaced with a bland chain offering, and that it will hopefully retain at least a little bit of character. 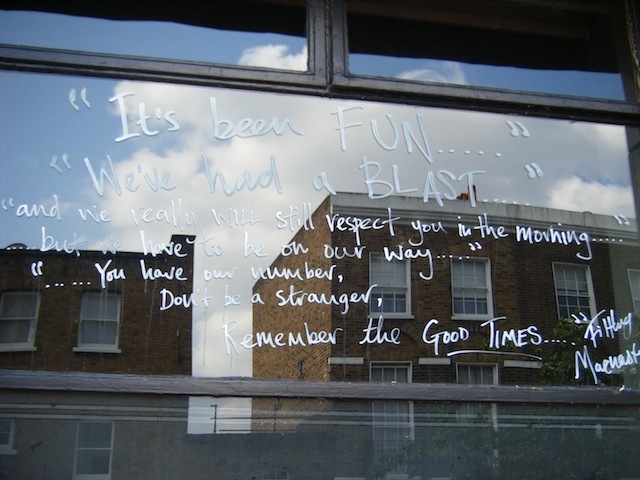 In a way, he gives Filthy’s a very fitting eulogy when he says, “It was a special pub. It had its day. And now it’s time to move on and Handmade are the best people to do it. However I do hope that somewhere amongst the real ale pumps and chalk boards telling of what fine foods are available, that the company will find a very small place somewhere in the pub to remember Filthy’s by, or the ghosts of [ex-regulars] Kremen, Sean and Terry the Pervert will forever haunt the bar”. So while philosophers and dreamers with a taste for heavy guitars might need to find a new stomping ground, one can take solace in the fact that the exuberant flavour of what once was will forever permeate the site of Filthy’s. 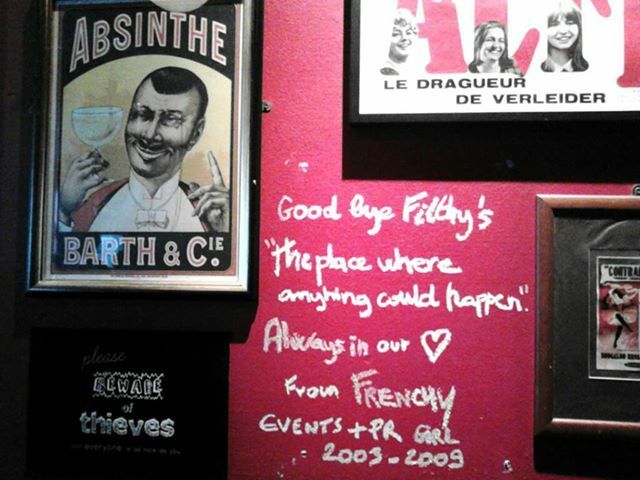 As someone inscribed on the wall at the unofficial ‘death of Filthy’s party’, before closure last weekend: “Goodbye Filthy’s, the place where anything could happen. Always in our hearts”.